So it's surprisingly hard to get a piece of ham to look ok next to pie no matter how delicious it is, but maybe that's just my problem. This is the ham I mentioned in my risotto post. It came from Mosefund Mangalista and we almost didn't get to have it for dinner. It got delivered to the wrong building so I ran around like a crazy person in PJs, flip flops, coat and a winter hat with a pom pom on top to get my package from the doorman in the building 4 doors down from me. I warmed it in the oven in a pan with a bit of water in the bottom. Then I added whole cloves and a satsuma mandarin to the water as aromatics. I was going to glaze it, but no one else seemed to mind if I didn't so, yay, one less thing to do! 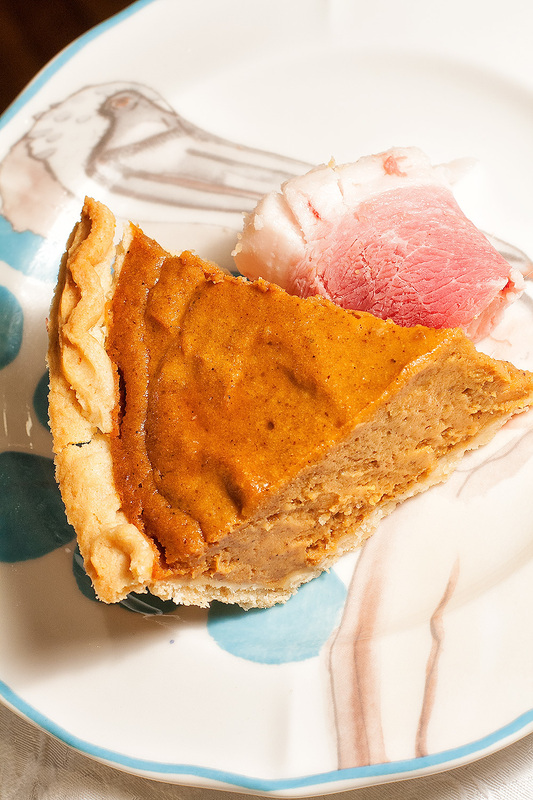 The sweet potato pie was made the semi-lazy way with a frozen crust, pumpkin pie spice, powdered ginger, and a dash of cayenne. I also blended (yes, I still don't have a food processor) the sweet potatoes with cream and butter this year before adding other ingredients instead of just dumping everything into the mixer. It yielded a smoother texture. I would've added the cream and butter anyway, but I think I like this whole puree thing. Also, I probably would have eaten the puree straight from the blender if I didn't have a pie to make.